Don’t wait till you’re thirsty! Drink 2 litres a day! Don’t just drink water! Cut out caffeine! Athletes and everyday exercisers alike have been bombarded with these messages on a daily basis. When you’re standing at the drinks machine what do you choose – water, cola or a sports drink? And what do you base your choice on – science… or marketing? You may have guessed the next bit – some of the same scientists who develop sports drinks were also influential in the sports medicine organisations that developed guidelines for sports performance. These same guidelines are filtered down to the average exerciser and into everyday health advice. Sports drinks are not the only thing that can meet your hydration needs though. 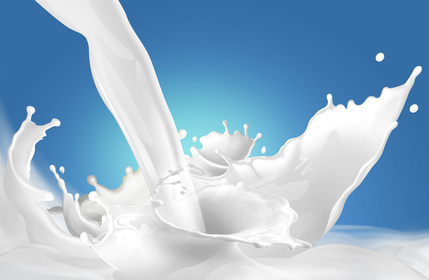 There’s growing interest in the effectiveness of milk as a hydration beverage. Recent research suggest there’s no difference in time to exhaustion in athletes consuming milk when compared to sports drinks during exercise. In addition, milk doesn’t negatively influence the cardiovascular, metabolic, or thermoregulatory response to exercise. This is important as an increase in heart rate, blood lactate or core temperature during exercise could have a negative impact on performance. Why does any of this matter? Quite simply, the role of a drink during exercise should be to replace water lost in sweat, to replace electrolyte losses (mainly sodium and some potassium) and to provide a source of energy. Milk does all of these things. Studies on post exercise rehydration also indicate that milk is a potential candidate, given its naturally high electrolyte content and the presence of carbohydrate in a concentration similar to many commercially available sports drinks. In fact, following exercise dehydration, milk has been shown to outperform both water and sports drinks. This may be due to its superior sodium content, as the recovery of sodium lost is a prerequisite of fluid recovery. Post-exercise it’s important to drink 150% of fluid lost to allow for ongoing urinary losses. The simple message from recent research is don’t drink water alone (though it’s fine with food if you have time) but don’t assume your rehydration fluid has to be a sports drink. Recovery from exercise is not limited to rehydration. It is vitally important that energy (glycogen) is replenished and that protein is available to promote an anabolic environment for muscle repair. In the two hours following exercise these mechanisms are up-regulated, creating a ‘window of opportunity’ for recovery. 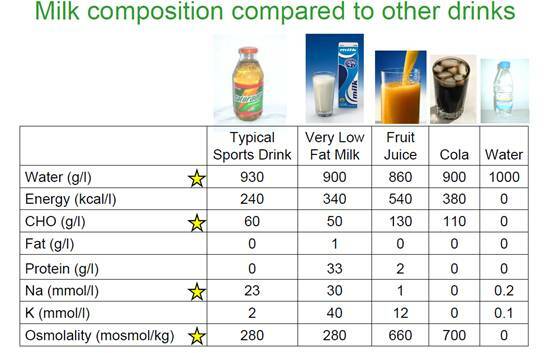 Milk may win over sports drinks as it contains both carbohydrate and protein in appropriate amounts to facilitate recovery. So much so that some evidence suggests greater recovery in muscle force 24 and 72 hours post exercise compared to sports drinks. The bottom line is don’t wait until after the hour drive from the gym to eat; plan ahead and take a humble carton of milk with you in your gym bag to assist immediately with post-exercise recovery. Hydration and recovery isn’t rocket science, it’s simply the supply of the right nutrients at the right time. Recent research suggests that we should search for those nutrients in our fridge rather than from drinks designed in a laboratory. I presume we’re talking about cow’s milk? As a vegan, I personally avoid dairy. After doing a ton of personal research over the past couple of years, I reached the conclusion that a lot of people’s bodies are often better off without dairy than with it. Milk might be good for hydration, but the cons (I’ve found) outweigh the pros. Of course, everybody’s body is different; I’m not saying there should be a blanket ban on dairy. But I think less emphasis on it as a ‘staple food’ would be beneficial to a lot of people. I checked up on this too, as I find the idea of drinking a whole glass of milk a bit repulsive! And yes, milk alternatives are excellent as post-exercise hydration. What you want is something that has the combination of hydration, minerals, protein and carbs in the same sort of ratios as milk, and most milk alternatives mimic those found in milk. So, yes, water is good for straight up hydration, but for giving your muscles the best chance of recovery you need some calories in there too. I’m currently swapping between Alpro Hazelnut (which is gorgeous but a bit too sweet for me) and Koko coconut ‘dairy’ after my runs. It’s also a lot easier to down a glass of something before my shower than fixing something to eat.